Yes, I know it's a photo of a photo. I didn't realise the importance of photographing everything well for anything other than my own records. Who knew quilting would ever play such a role in my life? 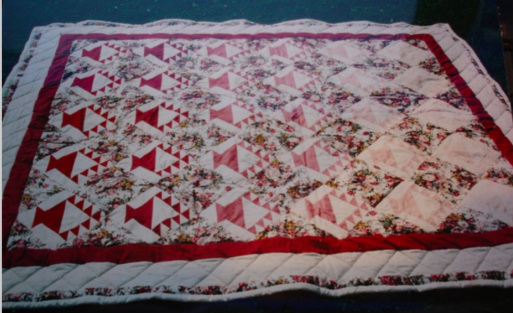 This May Basket pattern was from an Eleanor Burns' quilt in a day book. (Button below). I modified it slightly with six different shades of baskets in descending darker hues. Mamie loved the design and as Gram has not used it on a bed. From this point on I no longer considered myself a novice, having quilted for a grand total of three and a half years.